Now and then we like to spotlight something involving real-world animals — especially when they’re doing something that, while maybe not anthropomorphic, definitely feels like something you wouldn’t expect animals to do. 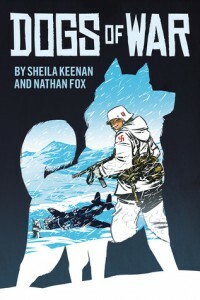 Dogs of War is a new full-color graphic novel, coming very soon from Graphix Press in softcover and hardcover editions. From Mile High Comics, here’s the blurb: “Dogs of War is a graphic novel that tells the stories of the canine military heroes of World War I, World War II, and the Vietnam War. This collection of three fictional stories was inspired by historic battles and real military practice, and each story tells the heroic adventures of a soldier and his service dog. Based on the real-life roles of military dogs that served as Red Cross rescuers, messengers, scouts, search-and-rescue teams, sentries, and mascots, Dogs of War captures both the adventure and the devastation brought on by war, as well as the celebrations of life and friendship between boys and their dogs.” Dogs of War was written by Sheila Keenan and illustrated by Nathan Fox.